Clint Eastwood has directed thirty films, not all of them good. But, when he gets it right, he makes stripped-down entertainment that engages our mind, speaks to our heart, and leaves us changed by the experience. In this story of conviction, courage and camaraderie, Eastwood gets it very right, indeed. This is the true story of two small-town kids who fell in love and struggled to build a life. 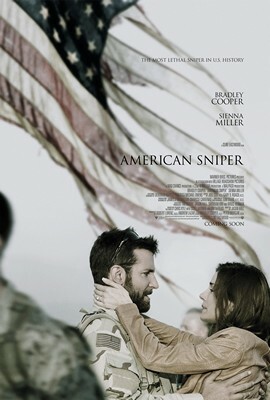 Chris Kyle (Bradley Cooper) learned to shoot well at a young age. As a Navy Seal sharpshooter in Iraq, his accuracy made him a legend. But war put “lightning in his bones;” his internal struggle – to find a balance between his duty to his country and his devotion to his wife Taya (Sienna Miller) and his family – would taunt and tear at him every time he came home. Cooper makes Chris stoic and steadfast. He shows us the pain beneath the courage, the eyes gone glassy from having seen too much, the brain struggling to convince itself he couldn’t have done more. Miller makes Taya easy to love, a lonely girl who’s both needy and nourishing, a woman eager to listen to a soldier unwilling to talk. She and Cooper have great chemistry and their scenes together sear with care and compassion; we feel her worries and her warmth, their hunger and heartbreak. The movie cuts back and forth – across time initially, and eventually across continents — showing only as much as we need to see. From cinematographer Tom Stern’s images of dark alleys, endless rooms, and huddled families, Eastwood builds a sense of unrelenting suspense as soldiers confront an enemy no one understands. And while the dialog is sometimes muddled, Jason Hall’s screenplay makes the characters real and the story complete. Before he left for his fourth tour, Taya told Chris simply: “You have to make it back to us.” As the missions increase, the days count down, and his demons gain power, we wonder if that’s an order that Chris, in more ways than he’d be willing to admit, might be unable to control. At the end, when the images have left the screen, the credits run in silence. As the lights come up, you’ll join the audience wiping their eyes.